With over 200,000 copies in print, the How Artists See series has won acclaim for making art accessible to children like never before. The books are now available in boxed four-volume sets, making it easy for teachers and parents to build a meaningful art library designed especially for young minds. 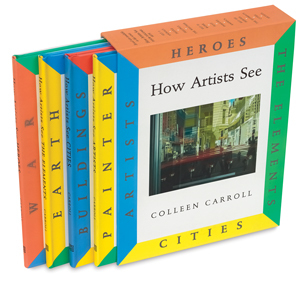 Each individual How Artists See title presents 16 diverse masterworks on a single, everyday, familiar subject — such as family, play, animals, and cities. Author Colleen Carroll engages children with open-ended questions designed to stimulate thought, build visual literacy, and expand the reader's artistic imagination. Whether poring over Matisse's goldfish, Jacob Lawrence's Olympic athletes, or Hiroshige's moonlit cityscapes, readers discover first-hand how the world can be transformed by the power of creativity — including their own. For children curious to learn more about the artists featured, short biographies are provided at the end of each volume, along with suggestions for further reading and a list of museums where the artists' work can be seen. As teaching tools, How Artists See titles are especially versatile, being readily adaptable to grades K-6 through the many activities detailed in the Teachers' Guide. Lessons intersect with disciplines as varied as literature, history, science, and social studies. Hardcover. 7" × 9" (18 cm × 23 cm). Page counts vary by set. Set C — This set includes How Artists See Heroes, How Artists See the Elements, How Artists See Cities, and How Artists See Artists. The boxed set of four volumes totals 192 pages.